Have you ever had difficulty getting stubborn dirt and dust off your shoes? Do you spend hours cleaning your leather shoes with store-bought shoe polish and find that it didn’t get the job done the way you wanted? Have you ever ruined your suede shoes by using a shoe polish that ripped away some of the fabric? Would you consider using a homemade shoe polish that doesn’t harm your shoes, instead of a store-bought product that may take extra time, effort, and scrubbing to remove the grime? Cleaning your shoes can be a tedious chore, especially if you’re not using the right products. If you create a homemade shoe polish using ingredients like lemon juice, petroleum jelly, and olive oil, you’ll get an optimum shoe shine in little to no time. 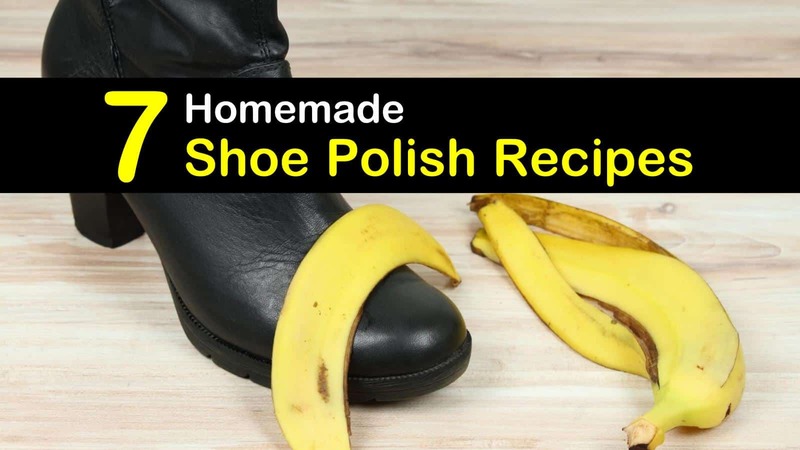 Our DIY shoe polish recipes and tips will clean your suede boots and shoes and your leather boots and shoes while saving you some extra money. If you’re looking to polish leather boots at home using natural, waterproof, and non-toxic ingredients, you’ve come to the right place! The best part about this recipe is you’ll know every component added and you won’t have to question if it’s harmful to your skin or your shoes. Simmer approximately two inches of water in a double boiler on the stove. Add the olive oil and beeswax and stir until they dissolve. Grind the brown oxide with a coffee grinder and mix with other ingredients. Place in a container and allow it to harden for approximately one hour. Putting the liquid in the fridge will cause it to thicken faster. Before applying the shoe polish, wipe your shoes with a damp cloth to remove any loose dirt. Apply the shoe polish with a clean cloth and buff out any marks you can. You’ll have shiny shoes in no time! If you’re looking to remove skid marks and water stains from your shoes, use a lemon juice shoe polish recipe to act as a friendly solution to your beloved shoes. Combine the ingredients. Use a clean, soft cloth to rub the solution onto your shoes. Allow the polish to soak into the fabric of the shoe or boot for a few minutes before buffing it with another clean cloth. A pair of leather shoes can last a long time, especially if you are using your own shoe polish to remove dirt and dust from the surface. The best way to clean leather shoes is to polish them regularly. Break out the petroleum jelly and dab a small amount on your leather shoes. Apply the jelly with a clean cloth and rub it in thoroughly. Doing this will soften the leather just enough to prevent cracking and will also give your shoes that extra shiny look. 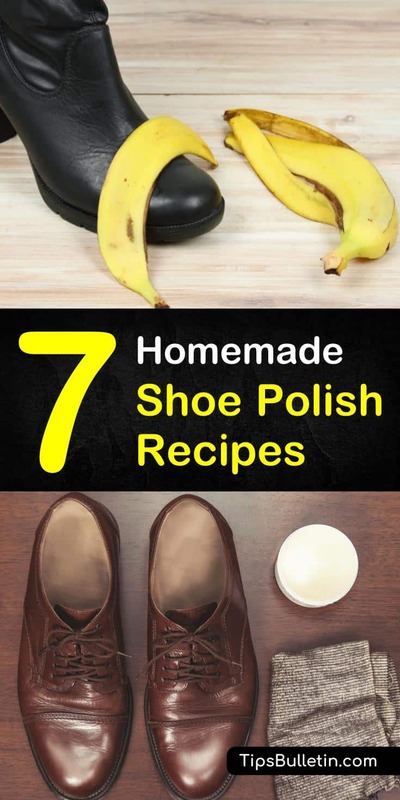 We bet you didn’t think a banana peel could polish your shoes, but it definitely can. So, if you’re cleaning your shoes and you can’t seem to find any other ingredients around the house, peel a banana, and use the inside of the banana peel to clean and buffer your shoes. Why can banana peels be used to clean your leather shoes? Because they have the element potassium inside! Rub the peel all over your shoe just like you would with shoe polish. Buff out all the scuffs and stains using a clean cloth and you should be all set. Rubbing alcohol has been known to clean leather shoes and boots for decades. Dab a few drops of rubbing alcohol onto your shoes and wipe over the surface with a cotton ball. Be sure to rub the alcohol into the shoe in a circular motion. Buff anything that you can out with a soft rag and your shoes should be shiny once again. Any oil can work when you’re trying to shine your shoes, but coconut oil is the easiest to buff into leather fabric. Put about a quarter teaspoon of coconut oil on a cotton ball and rub the solution into your shoes in a circular motion. After you cover the boots, buff out any scuffs or marks you see (hint: the coconut oil will make all scuffs and marks highly visible). All types of leather boots and shoes should be cleaned appropriately with products that do not harm the material. However, white leather is a particular case, as stains and marks are more visible on the surface. Be very careful when caring for white leather. You won’t want to scrub or buff solutions, oils, or pastes into the material with too much force, as you may cause damage. Instead, rub in a little bit of toothpaste using a soft brush. Buff out the marks that are visible with a clean rag or cloth. Repeat this process as needed, but be mindful that white leather can only take treatment methods in small doses. Cleaning your shoes should not be a complicated process. If it has been in the past, it won’t be any more, thanks to our DIY shoe polish advice. Stock up on ingredients like lemon juice, petroleum jelly, and olive oil so that your shoes can show off that extra shine. We hope you like our homemade shoe polish tips and tricks. If you did, please share our natural shoe polish recipes on Facebook and Pinterest with your friends.